Do you love spoiling yourself on weekends? After a long week, especially in this hot weather, I want nothing more than to relax in a hot bath with amazing smelling bath products. Unfortunately, most bath products aren’t just pricey, but filled with rather scary chemicals. For this reason, I love buying things that are natural, or making my own bath products at home. Even though many people don’t realize it, making your own bath products, especially body scrubs, is super easy. When I mean easy, I mean so easy that you can make it 5 minutes before your bath and enjoy the results. It is so easy to make and includes ingredients that many of us already have in our homes! 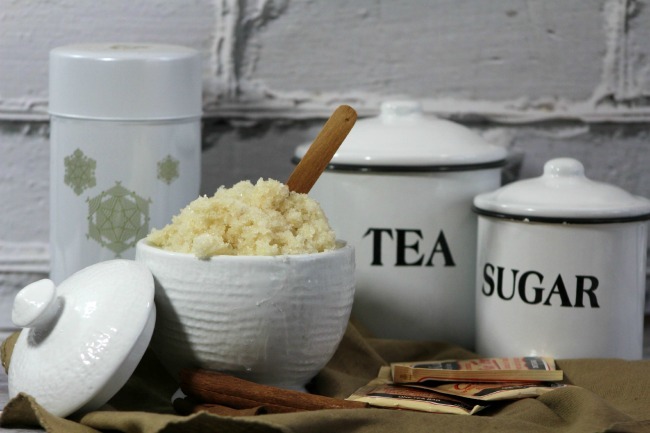 One of my favorite recipes to make at home is Vanilla Chai Scrub. As someone who loves the smell of chai tea, I think nothing is better than a special, relaxing bath that smells like my favorite tea. This simple, three ingredient recipe is great for relaxing during a night alone with a good book or gifting to someone special in your life. Make sure to tell us what you think of our Vanilla Chai Body Scrub Recipe below! Want a simple bath recipe that you can easily make at home? 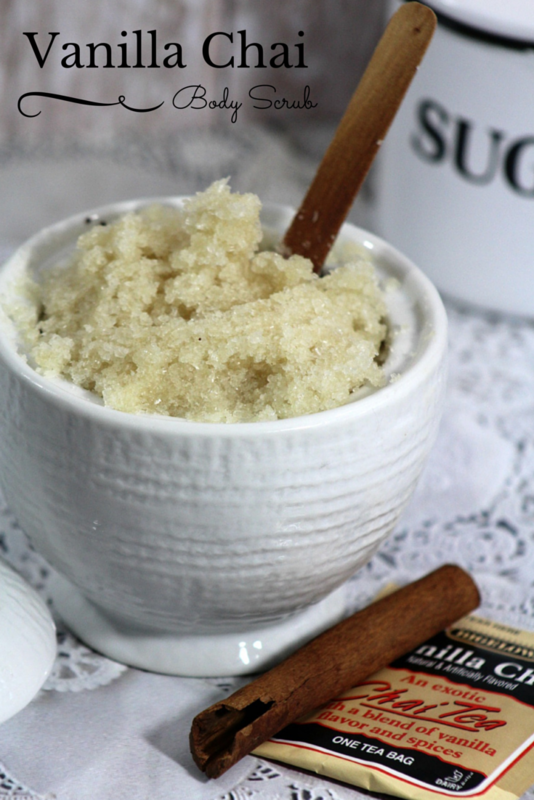 Check out our Vanilla Chai Body Scrub Recipe here! In a medium bowl, mash the coconut oil with the back of a fork. Add the Epsom salt to the coconut oil and mix thoroughly. Add the vanilla chai tea to the mixture and mix thoroughly. place in a Mason Jar or air tight container for storage. Ahh! There’s is nothing better than a hot bath, pampering yourself alone. I especially love the plsom Salts in this, because it pulls out muscle sorenoess! That sounds easy to make and, I actually have the ingredients on hand. I’m going to make and try this today.Thanks for sharing the recipe. I have been wanting to make a scrub for a while. I was thinking I would make a sugar scrub but this scrub sounds great!! This is amazing!!! I am pinning it right now! This looks fabulous! I am going to have to try it. I have never really found a good scrub that I like. Wow! This sounds awesome! I would love to make my own body scrub at home. I didn’t even know it was possible. How cool! Love this and i love scrubs but hv never made one. You hv been so kund to include all ingredients and detailed steps so I hate to ask you this. We live in an extremely small country town and Walmart isnt right around the corner so i was wondering if u knew if the oraganuc coconut oil is something easily found same with the tea or would i need to try to licate a health store? I tried this and really like it. I normally won’t use anything vanilla scented because I don;t like the smell. This is nice though, not overpowering. I’m going to make a big batch and put it into nice containers to give as gifts! Thanks for the recipe! I’ve never made my own body scrub, I can’t wait to try this, I love that it’s so easy to make. Thank you for sharing this DIY post. Chia Body Scrub is something I will definitely try. This does smell good. It works just as well as the store bought stuff at a fraction of the price. So glad it worked for you, Lisa! I hate paying the store prices! I love making homemade gifts. I have a huge amount of coconut oil, and I’ve love to try this! I really enjoy the do it yourself posts. There’s something very satisfying about being able to make a product at home instead of paying for expensive packaging at the store. Plus, you know for a fact what goes into it. Nothing better than a recipe for great feeling and health. Thanks so much for the instruction. I hope to see more do it yourself recipes in the future. I too, like to save and know exactly what I’m using. No chemicals that I can’t pronounce, let alone know if they’re safe. Oh wow I am saving this for XMAS gifts! Thank you for sharing this recipe with us.